Veins in Concrete Counter-tops have become a popular fabrication choice to many owners. With advancements in textures and colors which allow for endless design opportunities, applicators have chosen to bring natural looking veins into concrete counter-tops. SureCrete has created a counter-top veining material with 30 available colors. Place the Xtreme Concrete Countertop Mix in the bottom of the mold, where you intend the vein to go. Once the location of the vein is determined throw, Xtreme Veining material into the wet edge of the concrete covering the entire area intended to have a vein. Sometimes a small chip brush will help to push excess material into the vein. 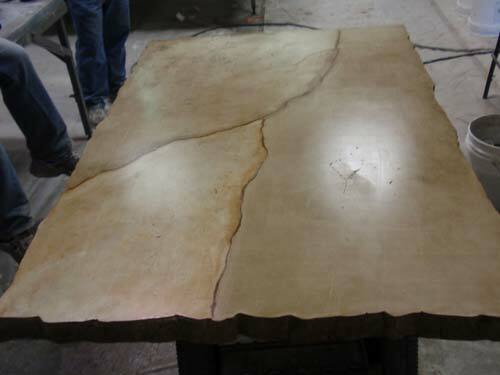 Vacuum out excess veining material and clean up with a rag any excess color pigment left behind. You are now ready to pour the balance of the mold with concrete. Although not necessary, using a spray bottle with water, lightly mist the vein after vacuuming the mold. This will help to activate the cement in the vein. In most cases the Xtreme PreCast mix can be demolded in 4 hours, this rapid set is not found in the veining material. The result of demolding your piece sooner than 24 hours may cause some parts of the vein to fall out. If this happens, use SureCrete Precast Slurry, to fix those areas.